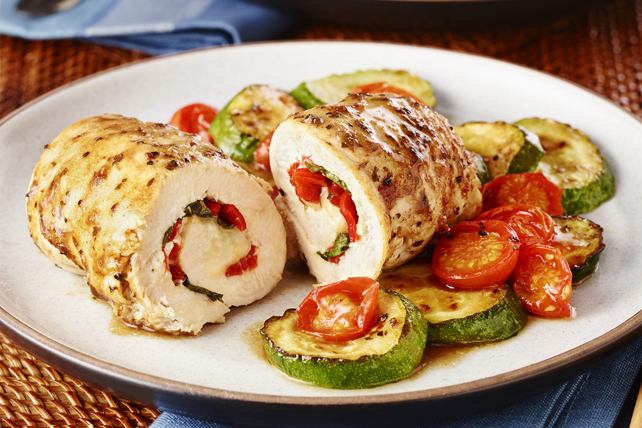 You might think this baked chicken dish is tricky, but our three simple steps will show you how to have this creamy stuffed chicken roll-up recipe on the table in less than an hour. Place chicken, top sides down, on work surface; top with basil, peppers and cheese. Roll up, starting at one short end of each; secure with wooden toothpicks. Place, seam sides down, on half of parchment-covered rimmed baking sheet. Toss zucchini and tomatoes with 2 Tbsp. dressing; place on other side of baking sheet. Brush chicken evenly with remaining dressing. Bake 35 min. or until chicken is done (165ºF). Remove and discard toothpicks. Serve chicken topped with vegetables. Serve with hot cooked long-grain brown rice. Prepare using your favourite combination of cut-up fresh vegetables.